Intruder or burglar alarms bring plenty of benefits to homes, and just seeing an alarm can deter many criminals. As well as providing you with piece of mind it’ll help prevent a break-in, whilst also aiding many home insurance claims. The recent recession has reversed the recent trend of home burglaries declining and now it would seem a priority to protect your home further with intruder alarm systems. Remember, burglars will be more likely to target a home without an alarm, rather than a property with one. These types of alarms either call you or a nominated person when triggered. This is a pre-recorded message to alert you or neighbours so the police can be called. 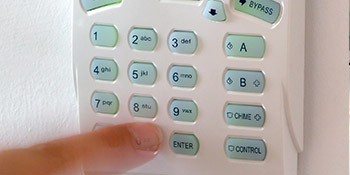 The monitored alarms are connected by telephone to a receiving centre. Your alarm system will have 24 hour monitoring and if tripped, your property will be called for identification verification. If this fails, the police or a nominated key holder will be called. Bell system alarms are the most popular in the UK and simply make a loud noise when triggered, which will either scare burglars away, or alert you and neighbours. It isn’t linked to a centre or the police though. Infrared systems are triggered when detectors are tripped. The detectors are carefully positioned by likely entry points such as doors and windows. Whilst they can be set off accidently, advances in the technology now make them much more reliable. Being able to leave your home for long periods of time, including holidays, without the worry of someone breaking into your property. Discounted home insurance. The extra protection intruder alarms offer are a winner with insurance companies and costs could be reduced, even with simple systems. The ability to secure both the inside and outside of your home. Even sheds and garages harbouring expensive tools can be protected. Possibilities of adding further security with smoke detectors and surveillance systems, which are crucial for larger homes and businesses. Intruder alarms protect you, your family and your property. They’re extremely important for all times of the year and will alert you to any burglars and intruders. If you’re interested in securing your home, complete the quick form below and receive up to four FREE quotes from local, vetted and reputable intruder alarm installers. Project: I would like to remove the current iron swinging gate with an automated hardwood gate with remote entry. Project: A quote for an Electric gate for a driveway, required please. Project: Sliding electric gates for drive way. Project: We require a cost to install electric sliding area across our double driveway. We currently have nothing there at the moment. Extremely happy with this company. I went with an alternative local company. This has no reflection on Home Security, the other company I chose was able to respond quickly to my requirements, which fit in with my schedule. The service provided was fast and all very professional . In giving me a choice of competitive quotes from nearby tradesmen. Able to quickly bring up companies which I was able to contact to discuss my requirements. It was helpful to have recommendations but I received a huge number of texts some of which were repetitive. I continued receiving these after I had responded. However, I was happy to have been put in touch with a local company rather than a national franchise.